An electrical substation is an installation with electrical equipment capable of interrupting or establishing electrical circuits and changing the voltage, frequency, or other characteristics of the electrical energy flowing in the circuits. The substation provides interconnection of transmission circuits and transformation between the network of different voltages. The substation is connected to the network through overhead lines. In some cases, it may not be possible to make a connection to the substation directly by the overhead line and cable entry must be considered. Connection of separate transmission and distribution lines into a system to increase efficiency and reliability of power supply. The different substation configurations are characterized by their busbar arrangements and generally, any number of circuits may be provided by repeating the pattern. Based on the construction and installation of switchgear, electric substations are of two types. Based on transmission voltage and function, the electric substation is classified into three types. 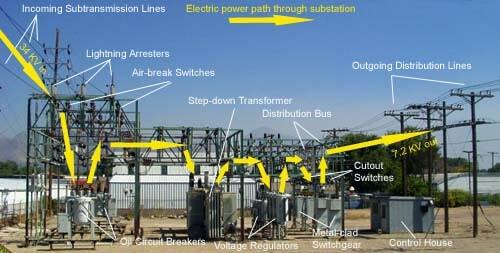 In addition to this, based on the installation premises there are four major types of substations. Air Insulated Switchgear Substation, as the name suggests, utilizes primary substation equipment whose terminals are in the air. Consequently, large clearances are required between these terminals and earth and between terminals of different phases. As a result, the ‘air insulated / open terminal’ substations occupy relatively large areas of land. Gas Insulated Substation or metal-clad equipment utilizes either solid or gaseous (SF6) insulation to allow phase to earth and phase to phase clearance to be drastically reduced. The space-saving advantages of gas insulated/metal-clad equipment can be significant particularly for high voltage substations in large cities where space is difficult to obtain and land is very expensive. Metalclad equipment may also be attractive for other reasons, notably visual impact in environmentally sensitive areas and operation in heavily polluted environments. Air insulated substations generally cost less than an equivalent gas insulated substation. Almost all Gas Insulated Switchgear substations are built indoor. GIS can be easily built underground to avoid any environmental concern. The internal GIS insulation is independent of atmospheric pressure. The transmission substation transformers support the transmission system and the smaller sub-transmission and distribution substation transformers. The transmission substation contains equipment used to sectionalize the electric transmission system when a fault or short circuit develops on one of the circuits. Circuit breakers in the transmission substation are used to switch generating and transmission circuits in and out of service. The faulted circuit is switched out of service automatically and de-energized, protecting the remaining portion of the transmission network from trouble. 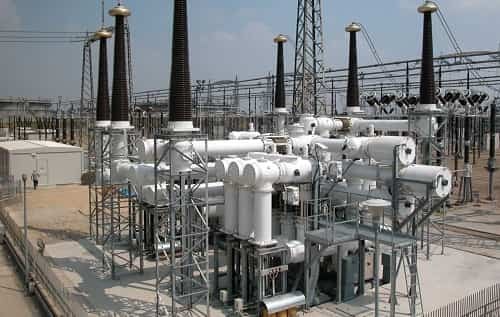 Electric substations with equipment used to convert high-voltage, extra-high-voltage (EHV), or ultra-high-voltage (UHV) transmission lines to the intermediate voltage sub-transmission lines or to switch sub-transmission circuits operating at voltages in the range of 34.5 kV to 161 kV are referred to as sub transmission substations. Subtransmission circuits and substations are located near to high-load concentrations, usually in urban areas. Subtransmission circuits supply distribution substations. 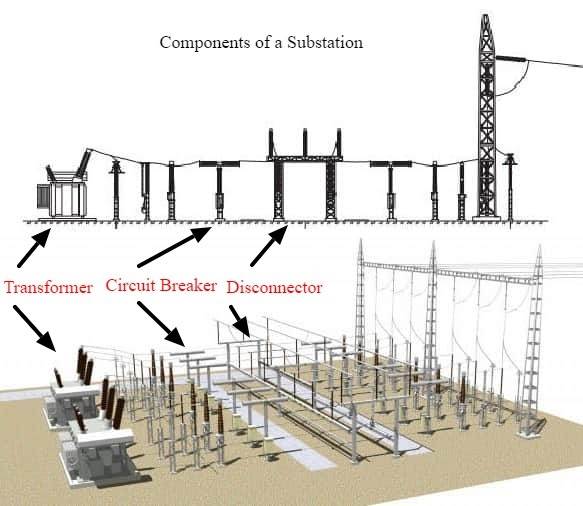 Substations located in the middle of a load area are called distribution substations. These substations may be as close together as 2 miles in densely populated areas. The substations contain power transformers that reduce the voltage from sub transmission levels to distribution levels, usually in the range of 4.16Y/2.4 kV to 34.5Y/19.92 kV. The transformers are normally equipped to regulate the substation bus voltage. Circuit breakers or circuit reclosers in the distribution substations are installed between the low-voltage bus and the distribution circuits. The distribution circuits vary in capacity from approximately 5 MVA to 20 MVA (1 MVA = 1000 kVA). Large distribution substations have power transformers with a capacity as large as 100 MVA and serve as a source to as many as 10 distribution circuits. If the power transformers do not have automatic tap-changing underload equipment, it is usually necessary to install voltage regulators. These above mentioned substations are explained in major types of substations. A substation performs a major role in our power system. Voltage changed from one level to another level. Voltage regulated to compensate for system voltage changes. Electric transmission and distribution circuits switched into and out of the system. Electric power quantities flowing in the transmission and distribution circuits measured. Communication signals connected to the circuits. Lightning and switching surges eliminated from the electric system. Electric generators connected to the transmission and distribution system. Interconnections between the electric systems of various companies completed. Reactive kilovolt-amperes supplied to the transmission and distribution circuits and the flow of reactive kilovolt-amperes on the transmission and distribution circuits controlled. Alternating current converted to direct current or direct current converted to alternating current. Frequency changed from one value to another. An electrical substation contains many types of equipment. To fulfill the function of a substation, they include a wide variety of equipments. Each of them will be explained in the next section. Power transformers are the most important equipment in an electrical substation. and to control the flow of reactive kilovolt-amperes in the power system. Power transformers installed in transmission substations will normally be constructed for and operate at voltages in the range of 138,000 volts to 765,000 volts or higher. Most substations will have three-phase transformers. Some substations will have three single-phase transformers in parallel installed in a bank. Often, a fourth single-phase transformer will be located at the substation to serve as a spare. If one of the transformers connected in the bank fails, the spare is energized to expedite restoration of electric service. 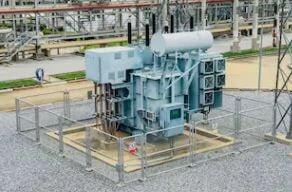 The capacity of the transmission substation transformers will normally be in the range of 1,000 MVA to 50 MVA. Power transformers installed in distribution substations will normally be constructed for and operate at the lower voltages and smaller capacities. The voltages will generally be in the range of 161,000 volts to 4,160 volts and the capacities in the range of 50 MVA to 5 MVA. 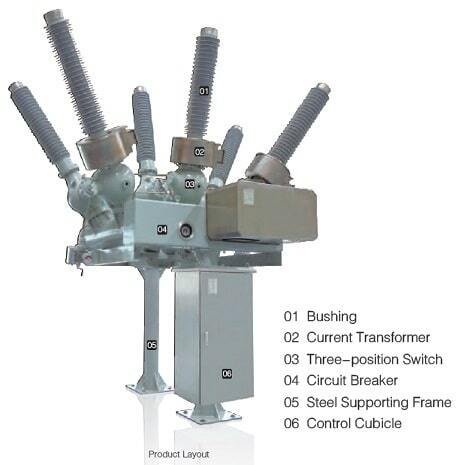 The figure given is a picture of a power transformer that is part of a distribution substation. Optional equipment that may be added to the substation transformer is tap changing equipment. The tap changer feature allows the voltage to be adjusted in increments as system-loading conditions require. The controls of the tap changing equipment are installed in a panel mounted on the side of the power transformer. Remote control of the tap changing equipment is usually installed as well. High Voltage and Medium voltage switchgears such as oil circuit breaker, SF6 circuit breaker, air circuit breaker, gas circuit breaker, and vacuum circuit breakers are used to switch electric circuits and substation equipment in and out of the system. A circuit breaker is a mechanical switching device, capable of making, carrying and breaking currents under normal circuit conditions and also making, carrying for a specified time and breaking currents under specified abnormal circuit conditions such as those of short circuit. The contacts of the circuit breakers are opened and closed by mechanical linkages manufactured from insulating materials and utilizing energy from compressed air, electric magnets, or charged springs. Some of the high-voltage circuit breakers utilize compressed air to operate the contacts and interrupt the current flow when the contacts are open. Operation of the circuit breakers is initiated, utilizing dc circuits, by manually operating a switch, by remote operation of supervisory control equipment, or by relays that automatically recognize predetermined abnormal conditions or electrical failures in the system. 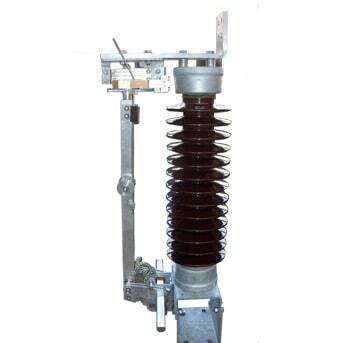 Various types of circuit breakers used in high voltage substations are. There are low voltage circuit breakers like mcb and GFCI that are not normally used in high voltage substations. MCBs are used inside the control panels. The substation buses are current-carrying devices that interconnect the individual pieces of substation equipment. The substation bus tubing (or bus bar) is aluminum or copper. Steel structures provide support for insulators, which are used to terminate lines, and support buses. Disconnect switches and other equipment are mounted on the steel structures. The lightning arresters are another important substation switchgear equipment that protects the electric system and the substation equipment from lightning strikes and switching surges. 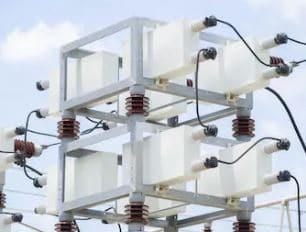 The lightning arresters are installed in a substation near the termination of aerial circuits and close to the more valuable pieces of equipment, such as power transformers. 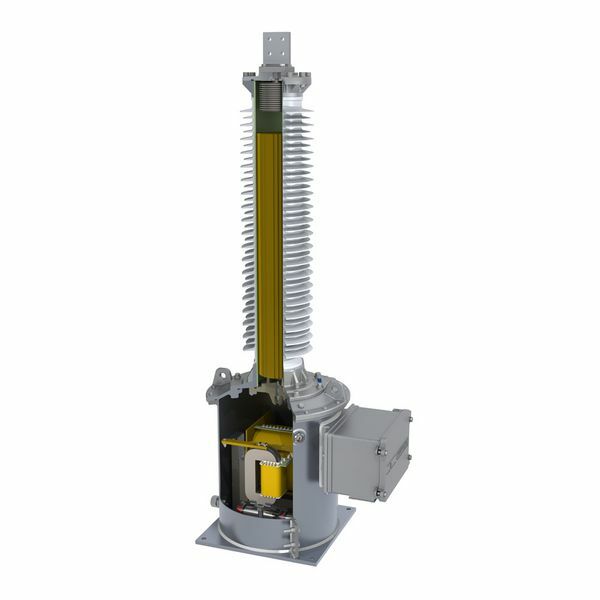 The power transformer has lightning arresters mounted on the radiators which are connected to both the 345 kV and 138 kV transformer bushings. 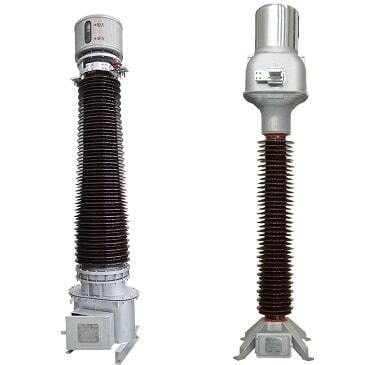 Lightning arresters contain semiconductor blocks, which limit the magnitude of high-surge voltages, permit the large-surge currents to pass harmlessly to the ground, and interrupt the power-follow current after the surge is eliminated. Metal-oxide surge arresters function like a ceramic capacitor at normal line voltage, limiting the flow of current to ground. When a high voltage begins to build up across the semiconductor blocks, they provide a low-impedance path to ground, which permits the surge current to flow to ground, limiting the voltage buildup and preventing the equipment from being damaged. 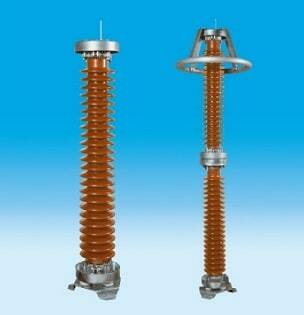 The semiconductor blocks in the arresters are manufactured using zinc oxide material. According to IEEE, Circuit Switcher is a mechanical switching device with an integral interrupter, suitable for making, carrying, and interrupting currents under normal circuit conditions. It is also suitable for interrupting specified short-circuit current that may be less than its close and latch, momentary, and short-time current ratings. Circuit switchers employ SF6 puffer-type interrupters for switching and protection of transformers, lines, cables, and capacitor banks and have fault-interrupting ratings suitable for use in protecting medium- to large load transformers. Models are available with and without integral disconnect switches. Now you may be confused on the difference between Circuit Breaker and Circuit Swither. Circuit Switchers are different from the circuit breakers. Circuit switcher is an economic solution adopted for switching substation equipment (eg: transformer). They are cheaper and generally has a lower interruption rating compared to circuit breakers. 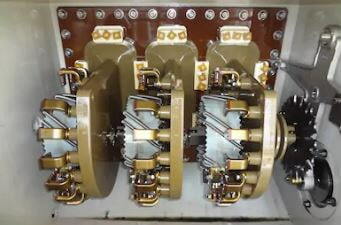 Circuit switchers are typically used on distribution transformer primaries where fuses were typically used in the past. Use of circuit switcher in place of fuses is a major improvement in protection. For most of these applications, there is no way that the cost of a 115 kV or 230 kV circuit breaker could be justified. The circuit switcher has the following benefits over circuit breaker: Compact, low cost, and some models include a visible break switch in their operation. Drawbacks over a circuit breaker include low-speed reclosing, and not designed for high-operation environments. Operation of circuit switchers is initiated by manually operating a switch, by remote supervisory control equipment, or by substation protective relays that automatically sense abnormal predetermined system or equipment conditions or electrical failures (faults). 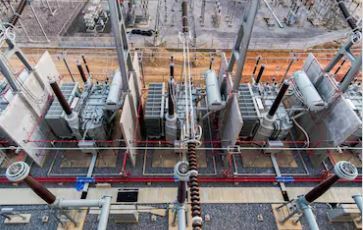 Circuit switchers serve to provide reliable, economical switching and protection for transformers, single-shunt capacitor banks, line-connected and testing connected shunt reactors, lines, and cables. Disconnectors (Isolators) are devices which are generally operated off-load to provide isolation of main plant items for maintenance, on to isolate faulted equipment from other live equipment. Air Insulated or open terminal disconnectors are available in several forms for different applications. At the lower voltages, single break types are usual with either ‘rocker’ type or single end rotating post types being predominant. At higher voltages, rotating center post, double end rotating post, vertical break, and pantograph type disconnectors are more common. Air break switches are used in lower voltage to disconnect on load. Disconnectors are usually interlocked with the associated circuit breaker to prevent any attempt being made to interrupt load current. Disconnectors are not designed to break fault current although some designs will make fault current. Most disconnectors are available with either a manual drive mechanism or motor operated drive mechanism and the appropriate drive method must be selected for a particular disconnector in a particular substation. 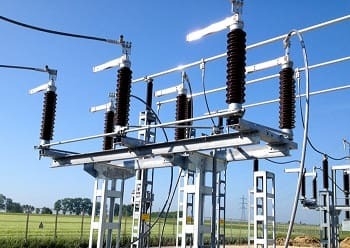 For example, in a remotely controlled unmanned double busbar substation the busbar selector disconnectors would be motor operated to allow ‘on load’ busbar changes without a site visit being required. Disconnector mechanisms incorporate a set of auxiliary switches for remote indication of disconnector position, electrical interlocking and current transformer switching for busbar protection. Earthing switches are usually associated and interlocked with disconnectors and mounted on the same base frame. They are driven by a separate, but similar, mechanism to that used for the disconnector. This arrangement avoids the need for separate post insulators for the earth switch and often simplifies interlocking. Normally earth switches are designed to be applied to dead and isolated circuits and do not have a fault making capability, however special designs are available with fault making capability if required. One practical point worth noting is that line or cable circuit earth switches are normally interlocked with the local line disconnector, but reliance is placed on operating procedures to ensure that the circuit is isolated at the remote end before the earth is applied. A current transformer (CT) is a type of transformer that is used to measure AC current. It produces an alternating current (AC) in its secondary which is proportional to the AC current in its primary. Current Transformer is one of the substation equipment used to convert the primary power signal to manageable values for metering systems, recording systems, protective relay systems, power generation, plant monitoring systems, SCADA and load control. The primary winding of a current transformer is connected in series with the high-voltage conductor. The magnitude of amperes flowing in the high-voltage circuit is reduced proportionately by the ratio of the transformer windings. The secondary winding of the current transformer is insulated from the high voltage to permit it to be connected to low-voltage metering circuits. Current and potential transformers supply the intelligence for measuring power flows and the electrical inputs for the operation of protective relays associated with the transmission and distribution circuits or equipment such as power transformers. Read more on Current Transformers. High voltages in substation are measured by reducing the voltage proportionately with equipment called a potential transformer. Its high-voltage winding connected to the transmission or distribution circuit and its low-voltage winding connected to a meter or relay or both. 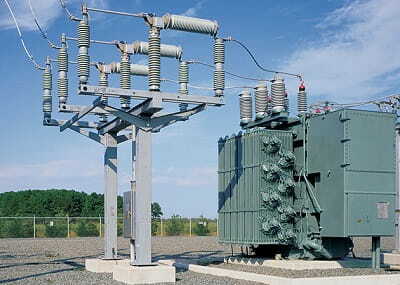 Potential transformers are required to provide accurate voltages for meters used for billing industrial customers or connecting utility companies. If single-phase transformers are used, three transformers are generally required to measure power on a three-phase circuit. High-voltage fuses are used in substations to protect the electrical system from faults in such equipment as potential transformers or power transformers. A group operated high-voltage disconnect switch and three power fuses are mounted on the terminal structure. The fuses are connected in series with the power transformer that serves as a source for the switchgear. 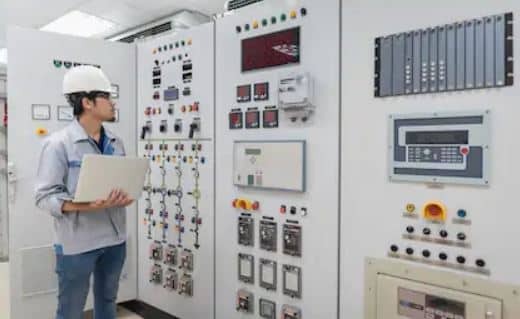 According to IEEE standard C37.20.2, in Metal Clad Switchgear ,the main switching and interrupting device is of the removable (drawout) type arranged with a mechanism for moving it physically between connected and disconnected positions. They are equipped with self-aligning and self-coupling primary disconnecting devices and disconnectable control wiring connections. Outdoor metal-clad switchgear provides a weatherproof housing for circuit breakers, protective relays, meters, current transformers, potential transformers, bus conductors, and other items necessary to provide electric-system requirements. Indoor switchgear must be installed in a building for protection from the elements. For the typical 13.2–7.6 kV distribution substation, the switchgear consists of a 2,000A bus and six (6) breaker cells. The breaker cells are one 2,000A main breaker, four 1,200A feeder breakers, and one 2,000A future bus-tie breaker that will serve as the mobile sub connection. One of the feeder cells is equipped with a capacitor bank isolation switch. When the capacitive reactance from extra-high-voltage transmission-line circuits exceeds the ability of the system to absorb the reactive kVA (kiloVars), shunt reactors are installed. The shunt reactor shown in figure is a three-phase single-winding transformer which serves as an inductive reactance on the power system, thus neutralizing the capacitive reactance associated with the long extra-high-voltage transmission line. Shunt reactors are usually located in substations and connected to a transmission line terminal through a disconnect switch. Communication signals in the form of high-frequency voltages are transmitted to the transmission lines through coupling capacitors. Some of the coupling capacitors are equipped with potential devices which make it possible to measure the voltage on transmission-line circuits. The coupling capacitor potential devices are accurate enough to be used for supplying voltages to protective relays but—unless they are specifically compensated —not accurate enough to supply voltages for meters designed for billing purposes. Figure above shows a coupling capacitor voltage transformer (CVT or CCVT). The substation control house is used to protect the control equipment, including switchboard panels, batteries, battery chargers, supervisory control, power-line carrier, meters, and relays, from the elements. Underground and overhead conduits and control wire are installed to connect the controls of all the equipment in the substation to the control panels normally installed in the control house. Each substation usually contains several thousand feet of conduit and miles of the control wire. 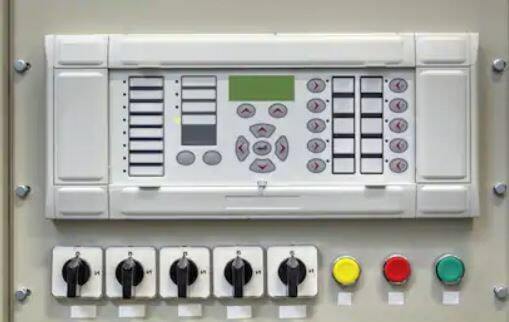 The control panels installed in a control house provide mountings for meters, relays, switches, indicating lights, and other control devices. Substation protective relays installed on control panels are used to sense electrical failures on transmission and distribution circuits or in pieces of substation equipment, such as power transformers, substation bus, reactors, capacitors, and circuit breakers. Some relays are used to supervise, monitor, and perform predetermined operations as required by system conditions. Relays automatically operate their contacts to properly identify the source of trouble and remove it from the electrical system. Protective relay systems provide overcurrent, differential current, overvoltage, under voltage, over frequency, under frequency, directional, and distance protection. The supervisory control equipment permits the remote control of substations from a system control center or other selected point of control. 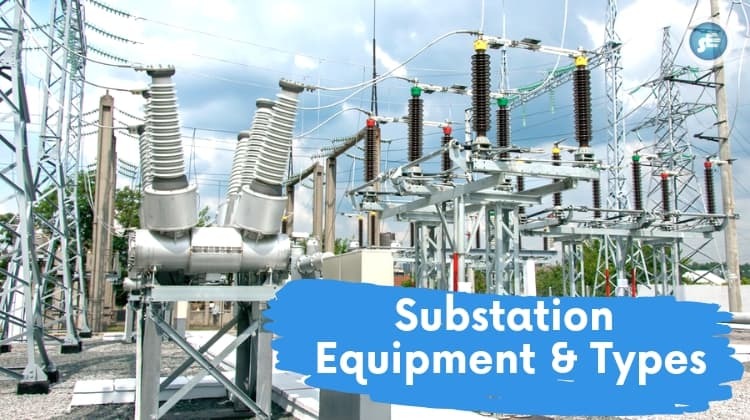 Distribution substations are normally unattended and operate automatically or are controlled remotely by supervisory control equipment from a central control center. Supervisory control equipment is used to open and close circuit breakers, operate tap changers on power transformers, supervise the position and condition of equipment, and telemeter the quantity of energy flowing in a circuit or through a piece of equipment. The remote terminal unit (RTU) is the interface between the supervisory control and the substation equipment. 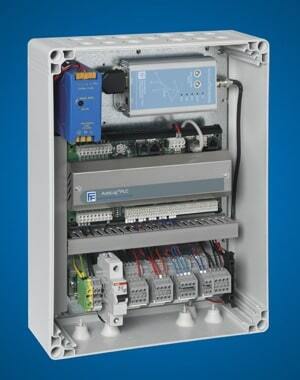 The RTU is a monitor and transmitter of the substation and electric system data. The Remote Terminal Unit (RTU), shall be installed at Substations to acquire analog data and digital data. Analog data includes KW export, KW import, frequency, OLTC, power factor, maximum demand, planned outage duration & numbers, forced outage duration & numbers, electricity consumed locally, MVA capacity of Sub-Station, length of Transmission lines etc. Digital data include status of isolators, circuit breakers etc. 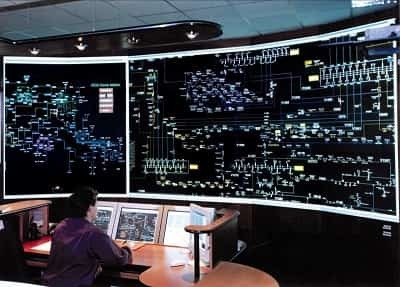 at each Sub-Station under this scope of work and transfer those information to data server at supervisory control center and back-up supervisory control center. The digital fault recorder records fault data and provides an accurate sequence of events for system disturbances on the electric system. A digital fault recorder (DFR), is an IED that records information about power system disturbances. It is capable of storing data in a digital format when triggered by conditions detected on the power system. Harmonics, frequency, and voltage are examples of data captured by DFRs. 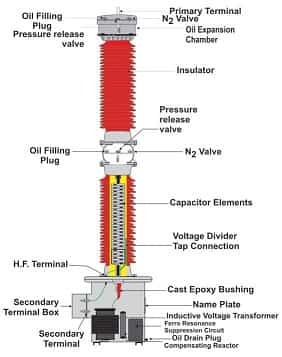 Reactive kilovolt-amperes can be supplied to the electrical system by connecting banks of capacitors to the distribution circuits in substations or out on the distribution lines to neutralize the effect of customer-inductive loads. Capacitors used in this manner help to control voltages supplied to the customer by eliminating the voltage drop in the system caused by inductive reactive loads. Capacitors in distribution substations are usually mounted in metal cubicles. The capacitors, mounted on the racks in the cubicles, are usually single-phase, single-bushing units rated 100-kVAR through 400-kVAR capacitance, 60 Hz, and a voltage consistent with the distribution system. They are connected between each of the three-phase conductors and ground. Capacitor units for the higher distribution voltages and those connected to conductors energized at transmission voltages are normally mounted on open-type racks. The capacitor units are connected in series and cascaded to provide equipment that can be connected to the higher voltage distribution and transmission systems. The voltage regulators maintain the system voltage on the distribution circuits. As settings on the voltage regulators are adjusted for various load conditions that occur, the desired voltage is obtained. The power-line carrier equipment provides high-frequency voltages to be used for transmitting voice communications or tele-metering signals on high-voltage transmission-line circuits. In the case of voice communications, the sound frequency modulates a high-frequency signal connected to the transmission-line circuit by means of coupling capacitors. This equipment permits using the line conductors for communication, relaying, supervisory control, and metering in addition to the transmission of electric power. Radio signals used for point-to-point communications between substations or other power-system facilities operating in the megahertz frequencies are called microwave. The frequencies range from 952 MHz to 13,000 MHz or higher. Microwave radio signals are used for communication channels, protective relaying, supervisory control, and remote metering. 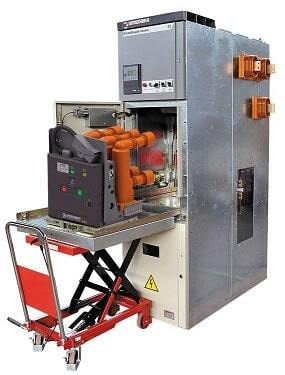 Control batteries supply energy to operate circuit breakers and other equipment. It is necessary to use dc control systems with a storage battery as a source to make it possible to operate equipment during periods of system disturbances and outage. Battery chargers are used to automatically keep the batteries charged completely to provide sufficient emergency power for all necessary operations.